I’m planning to report on most of my Page Presents classes, as time permits, going back to the first of the year. For our storytime class last month featuring Lewis Carroll’s Jabberwocky, I tried out a little participatory drama. Page the Bookworm announced that our theme for the day was silliness, and thus we had to start out by shaking our sillies IN (not OUT) to the tune of Raffi’s Shake My Sillies Out. Then I showed them a big pop-up book, Silly Heads, by Cathy Shuttleworth et al., and I started mixing up the fairy godmother in the tiara with the wizard’s beard, or putting the pirate hat on the bejeweled ingenue princess, etc., etc. This elicited much hilarity. By now, they were getting into the spirit of silliness, so Page showed off his Jubjub bird costume as I explained the story of Jabberwocky “in prose.” Then I divided the group into two sections. “You are the Slithy Toves,” I told one section, bestowing upon them colorful gauze scarves to wave from side to side. The other group got wands with crepe paper streamers. “You are the Mimsy Borogoves,” I instructed them, “and you must pop up from time to time and wave your tentacles.” My husband wore an owl mask and held other owl masks in each hand, so he resembled a three-headed Mome Rath. One head would pop up, uttering a mournful “Moooooome…” Then the middle head would shriek “Raths!” and the third head would comment wryly, “Outgrabe…” It was quite a performance. He also operated the Fr-r-r-umious Bandersnatch, a dragon-like kite. I played the father, the son, and the Jabberwock. We used a large dragon head puppet for the Jabberwock, which was perfect for flinging off in its death throes and then galumphing back with. Some background music added atmosphere to our dramatization. Afterwards the kids made paper plate masks. They had the option of using a whole plate or using one of several templates provided to shape the plate before embellishing it. I just put out a lot of odds and ends from our crafts closet, and the children did the rest. I had been looking forward to trying a very open project like this, which I thought would be pedagogically much better for developing their creativity. They had a wonderful time with their mask-making, and continued their dramatic play wearing the masks. Long after the session ended, one little boy was still wearing his mask as he looked at picture books. By the way, while we’re on the subject of Jabberwocky, please don’t miss the humor and artistry—and fabulous puppets—of the Crabgrass Puppet Theater’s performance! This week in our Page Presents class, I had to take over Mr. Matt’s Minute of rhythm instruction, since Matt’s daughter Zoey had the croup. Matt had emailed me his idea about teaching an African “marketplace” rhythm that the kids could play on their bodies. This worked out really well. I started out at a very slow tempo, and when everyone was slapping out the rhythm on their knees and hands, I asked them if they could do it faster. We gradually worked up to a much faster tempo, and then I played Angelique Kidjo’s Battu, from the African Playground cd. Everyone did amazingly well at keeping the rhythm going at this very fast tempo! Whenever they started to lose the beat, I had them switch to clapping out downbeats. Then on the next time around we would go back to the marketplace rhythm. It was fun and challenging! Then I told the West African story, The Magic Gourd, by the wonderful Baba Wagué Diakité. I had help from my handsome black Rabbit puppet and my new Chameleon puppet. It is a time of prolonged drought, and Rabbit is poor and hungry and hard at work trying to find a few roots to feed his family. He takes time to free Chameleon from a thorny bush, and Chameleon gives him a magic gourd that fills with whatever is asked for. Rabbit shares his plenty with his friends and neighbors, and soon the greedy king hears of the gourd and sends his guards to take it by force. With the help of Chameleon, Rabbit tricks the king into giving back his gourd, and the king learns a lesson about generosity. Rabbit and Chameleon, of course, already know that true friendship is the greatest treasure of all. …and here is a gallery of the ones made by the kids! Well, actually National Library Week was last week, but we were so busy at my library that I’m just now coming up for air. On Snapshot Day, the photo that got away was the huge throng of people waiting to get in the library when it opened. I thought, “Oh, it’s a flash mob!” There must have been 30 people jammed up outside the doors, all dressed in bright colors, including one person with a huge multicolored golf umbrella. It was a Kodak moment if there ever was one. Unfortunately, my boss (who had the camera) got called away to deal with something and I did NOT want to delay opening the door! The day before tax day, there were a lot of people needing to use the library computers to file their taxes. I can’t wait to play around with xtra normal! Yippee! I solved the problem of the image gallery showing up on all the pages! “Think Different” is my motto. I scrapped the image gallery and created a set of rotating header images, so you get a different image every time you load or refresh a page. I think it looks pretty spiffy! We are almost ready to go live, I think. Vicky looked at the site on a PC at work the other day and came home all horrified about it, so we had to resize all the images. Yowie, my pain is like a red, red nose after all this clicking and dragging. I’m really hoping that everything will look OK the next time she checks it out. Then maybe I’ll feel well enough to return to my co-hosting job at Page Presents this week. I want to show everyone the site so they’ll know I haven’t been slacking! We had a great Page Presents class this week. Ravi couldn’t wait to show me his new sock puppet, inspired by Page. He had one of his old socks—so little!—and his mother had stitched a tiny red nose. Its button eyes were big red dinosaurs (Page’s eyes are lime-green “I read banned books” buttons). Too bad Page wasn’t there to meet his new little friend. He was at home obsessively slaving over our new blog. Everyone really misses him. Matt taught a call-and-response rhythm game, and my elderly chimp puppet told the story of The Monkey and the Alligator (adapted from The Monkey and the Crocodile: A Jataka Tale from India, by Paul Galdone). 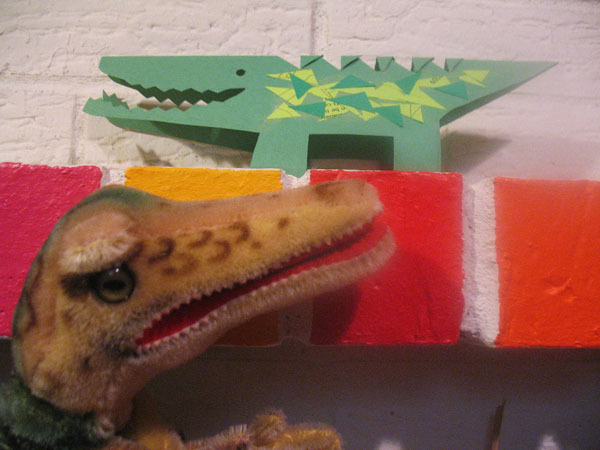 Mr. Monk was ably assisted in his dramatization by Mr. Al, my new alligator puppet (formerly owned by of one of my childhood playmates and sent to me recently by his mother, with his blessing). Afterwards I had conversations with a couple of moms who were new. One of them wanted suggestions for poems for her second grader, who had to memorize a poem for class. Just the day before I had been amazed to overhear a little girl reading from A Child’s Garden of Verses to her little sister. I might have hesitated to recommend it otherwise, for fear that it might seem too old-fashioned, but the girls were discussing it with obvious enjoyment, so I started with that. The mother was amazed that I could still spout excerpts from it. She went home with a stack of selections, including a collection by Jack Prelutsky, an Oxford collection of children’s verse, collections by A.A. Milne and Edward Lear, as well as Robert Louis Stevenson’s venerable volume. The other mom told me how happy she was that we allowed the children to use (blunt-ended) scissors and to make their own crafts. She talked about how appalled she was that, so often these days, the focus is on the product and not the process. I agreed whole-heartedly. Since I began leading the Page Presents program in December, it has been gratifying to see the parents and kids gain confidence in their own creative impulses and begin personalizing their weekly creations instead of adhering slavishly to the model and the kit pieces as presented. Hi everybody! 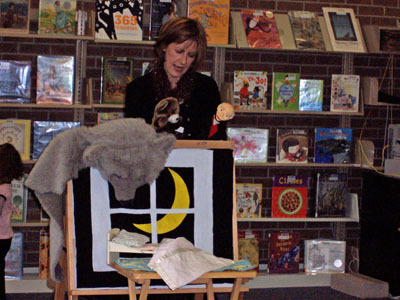 I’m Page, co-host of Page Presents: Learn with Stories, Music & Art at the Juan Tabo Library. I’m a Webworm, as well as a bookworm, as you can see. Everybody thinks I’ve been on vacation to someplace cool like the British Library, but I’ve actually been wearing my nose out at our MacBook Pro, updating my skills and setting up our blog. Ohhh, my sore nose! All that clicking! WAAAAAAAAA, I want an iPad!!!! Customizing our new blog has been a LOT of work. Right now I still can’t figure out how to get the image gallery to be only on the Welcome page. But I’m gonna give my nose a break. I think the blog looks pretty cool already, though, don’t you? When my nose feels better, I’ll add a colophon (that’s something we bookworms know about, I’ll explain later). In the meantime, I wanted to tell you that the fonts we used on the banner image for the site are inspired by the work of Alexander Girard. Girard Sansusie and Girard Script were created by the über-cool type foundry, House Industries. Check out their fab tribute to Girard. Vicky has been wishing for their Girard blocks for ages and ages. This week Page Presents featured a special guest presenter! Matt and his daughter Zoey are regular attendees, but not everyone knows that he is a professional percussionist and music educator. “Mr. Matt” brought his portable drum set to the library and enthralled everyone with his interactive explorations of The Beat. He asked the kids if they knew what number comes after 1. “Two!” they shouted, and he proceeded to tap out a duple meter. “What comes after 2?” “Three!” and now we heard a waltz rhythm. This went on up through 9! We also learned to recognize a jazz rhythm that goes…Door, shut the door. And a samba rhythm…Boom-chick-a-boom. We all got to play along with the music on rhythm instruments. The kids were thrilled when Mr. Matt invited them to try out his drum set! Then we made our own paper plate tambourines with monkey faces (inspired by the book Hand, Hand, Fingers, Thumb. Afterwards Matt was critiquing his teaching and wondering if he had overloaded the kids with too much information. I suggested that we could have “Mr. Matt’s Minute” every week, and he could teach one or two simple concepts that we could repeat from week to week. Then, when he brings his drum set again for a longer session, we could see if this has made a difference in the kids’ understanding of rhythms. What fun! Raggy bears, baggy bears, shaggy bears too. 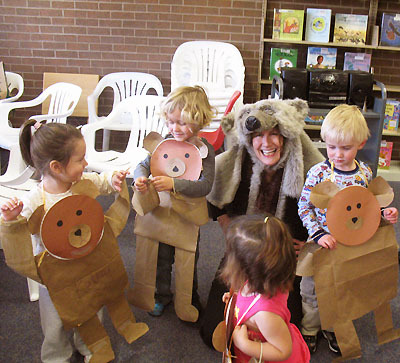 Then we made bear bodi-puppets (I got the idea for bodi-puppets from the excellent book, Storytelling with Puppets, by Connie Champlin). The head of the puppet was a paper plate covered with a brown construction paper face. The body of the puppet was made from a brown paper grocery bag. The arms were made of strips of burlap, with one end stapled into the puppet body, and a seam enclosing a rubber band at the other end. The puppet hangs in front of the child’s body, and the rubber bands on the puppet’s arms go around the child’s wrists. The child’s arms become the puppet’s arms, and the puppet comes to life…perfect for dancing along to a recording of Waltzing with Bears. I discovered this great music video for Waltzing with Bears on YouTube!